The Sacramento midtown farmers market at J and 20th has been going for two Saturdays now. The market is somewhat different from the main Sacramento Farmers Market I usually attend because it has more prepared food, though it still has a good complement of fresh and dried food. The market is only 8 blocks from my house, though the main one under the freeway on Sundays at 8th and W is only 16 blocks, Chavez Plaza on Wednesdays is 11 blocks, Fremont Park on Tuesdays is 1 block, Capitol Park and Capitol Mall on Thursdays are 3 blocks and 12 blocks respectively. Clearly I’m blessed to be in the middle of so many farmers markets. This density of urban amenities is why I love living in midtown. I’ve heard great things about the Saturday Oak Park farmers market, and will visit as soon as I can. The more unique character of the Midtown Farmers Market Sacramento, however, is that it encourages shopping by bike. 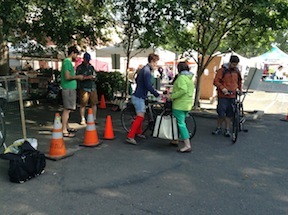 Sacramento Area Bicycle Advocates (SABA) is providing bike valet service for the market, and a lot of people are coming by bike. There have never been less than two cargo bikes, and sometimes many more, and the large bike valet corral has at times filled up with bikes. Impressive! Why is this significant? As I’ve said before, the two things we do in our lives that have the most impact on the earth are what we eat and how we get around. It is not, however, just the impact on the earth, but the impact on our communities. Eating local and organic, and getting your food home on foot and on bike also creates a more livable community. At the main farmers market, there are traffic jams on W Street between Southside Park and the market, created largely by people driving to the market. People crossing W on foot to and from the market are at risk from drivers who fail to yield at the crosswalks (some do yield, but most do not). There are people who bike to this market, but the traffic around the market is discouraging to many people, and the bike parking leaves a lot to be desired. The wave racks are hard to use, and impossible for cargo bikes, and there is not nearly enough bike parking. A lot of people drive to this farmers market, which undoes part of the good that the farmers market creates. The other farmers markets seem to have a bit less driving and a bit more walking as people visit them on their lunch hour, walking from work in downtown. The midtown market, however, was set up from the beginning to emphasize walking and biking. For one, there are not expansive surface parking lots nearby, so people driving have to hunt around for parking. Less convenience engenders less driving. The bike valet service was not an afterthought, but part of the design. Credit to the Midtown Business Association and Liz Studebaker for having a broader vision of what a farmers market can be. I live by myself and so have an easy time carrying my moderate purchases on my bike. People with families, however, have a challenge. What is the solution? Cargo bikes! The one pictured at right is the most unique I’ve seen, but there have been many others. Elle’s new Bullitt cargo bike was there, and several Yuba Mundos. 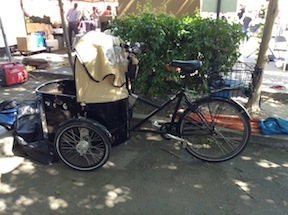 I’m seeing more and more cargo bikes around town, and they are the perfect way of getting produce (and kids) back home. There is a lot of information on cargo bikes on the Internet, from buying to using, but Elle Bustamante’s Sacramento-focused site, Tiny Helmets Big Bikes, is a great starting place. There have been a lot of discussions online, and a bit of research, about the carbon footprint of farmers markets relative to supermarkets. A lot of little trucks carrying small amounts to farmers markets, versus a smaller number of big trucks carrying large amounts to supermarkets. It seems to be a wash, from a transportation or carbon perspective. Industrial organic, which is what one largely buys at the supermarket, is not that much different from non-organic big agriculture as they are both dependent on high fossil fuel inputs for planting, tilling, harvesting, processing, packaging, warehousing, and transportation. The pesticides, herbicides, and chemical fertilizers used by big ag have a significant carbon footprint in and of themselves, but it is only part of the footprint of large scale farming. Industrial organic is certainly better for the soil than big ag, but not necessarily much better for the earth overall. Small scale organic farms tend to substitute human labor and slower methods for the some of the fossil fuel intensity. So the on-farm footprint is significantly better. I don’t see this as a “yes, but”, rather as a “yes, and.” Farmers markets, small farms, organic food, bikes and walking, all are a good thing. Hope to see you at the Midtown Farmers Market Sacramento next Saturday! My Sacramento Farmers Markets photos (Flickr).